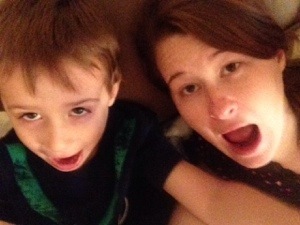 I am thankful for all the ways my kids made me laugh today. I needed it.i can’t remember them all, but I will share a few. Sylvia-Kate climbed on top of a surround sound speaker and stood up holding onto the entertainment center, and she was mighty proud of herself. Then she cried because she couldn’t get down. Lincoln put on Steven’s hat sideways and his sunglasses and sang a rock song about Ninja Turtles. Lincoln informed me that Subway’s cooking was better than mine. 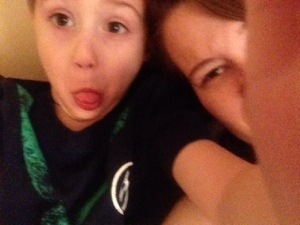 And Lincoln started the day wanting to take silly selfies with me.